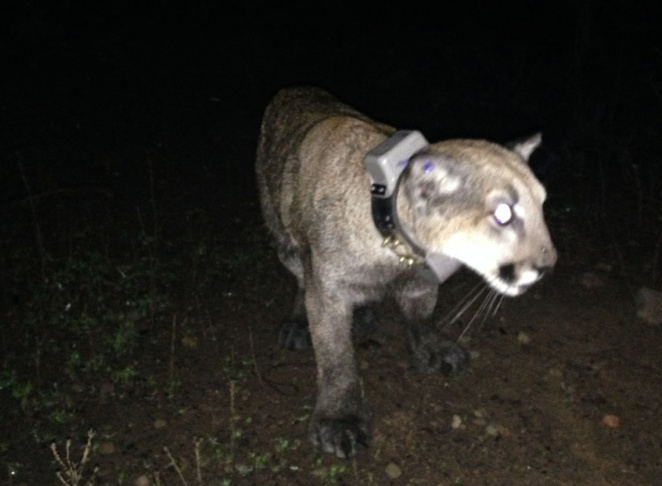 Mountain lion P-43 seen on July 23, 2015. P-43's remains were found in September. P-34, a juvenile female researchers began following when she was only three weeks old, was found dead by a runner on a trail in Point Mugu State Park on Sept. 30. P-34 seen waking up after being collared by National Park Service researchers on Dec. 19, 2014. She had been spotted under a trailer in a mobile home park in Newbury Park, according to the Park Service. Mountain lion P-43 seen in her den on July 23, 2015. P-43's remains were found in September. Three young mountain lions have been found dead recently in the Santa Monica Mountains over the last several weeks, according to the National Park Service. The most recent to be discovered was P-34, a female who was apparently killed by rat poison. P-34 was found dead on a Point Mugu State Park trail last week, Sept. 30, by a runner, according to the Park Service. Dr. Seth Riley, wildlife ecologist for the Park Service, told KPCC that the lion is being tested for the presence of harmful toxins. In the meantime, initial examinations make National Park Service biologists suspect anticoagulant rodenticides caused the death. Rodenticides have been shown to be deadly for coyotes and raptors and lead to deaths from mange in bobcats, but their effects on mountain lions still aren't well understood. 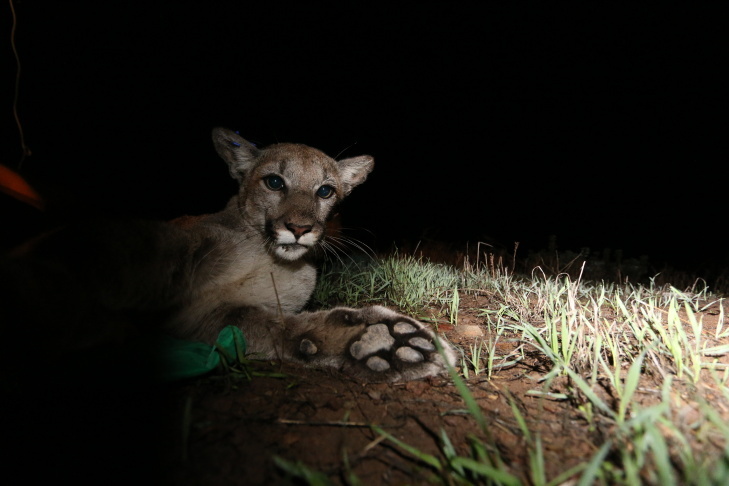 The Santa Monica Mountains puma population has the only two instances of death attributed solely to rodenticide ingestion in Southern California. "The truth is we're putting these poisons out there, affecting all kinds of wild animals; we really don't have a clue, in my opinion, what effects they may or may not be having beyond the basic effects of affecting their ability to clot the blood. 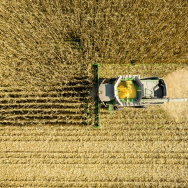 But in the cases of P-3 and P-4 and it looks likely in the case of P-34, those consequences have been lethal," Riley said. P-34's sibling P-32 was killed in August after being struck by a vehicle on Interstate 5. Last month, P-43 and a sibling's remains were found, according to a release from the Park Service. The 3-month olds were were eaten by another animal. P-43's mother P-23 has had two litters, both of which were killed by other animals. 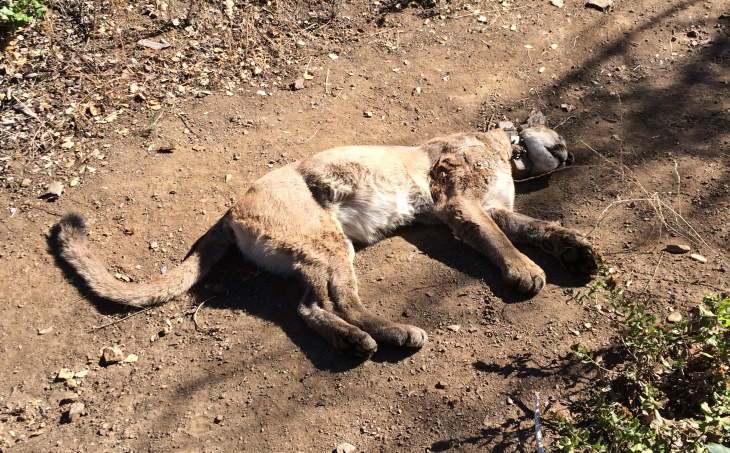 Two other mountain lions and many coyotes have died from poison as well, with exposure to the poison also causing a severe disease epidemic in bobcats, according to the release. Kian Schulman, founder of Poison Free Malibu, which is working towards a total ban of rodenticides and pesticides from the City of Malibu, said the death of P-34 points to an ongoing problem of rodenticide use. “We must do something immediately about this cruel and unnecessary poisoning to our wildlife. This is a major disaster in our wildlife ecosystem here, and strong actions need to be applied as soon as possible,” Schulman said. The population falls within a portion of the Santa Monica Mountains that is largely isolated by highways and development. A large push is underway to raise funds for a wildlife bridge that would extend over the 101-freeway at Liberty Canyon in Agoura Hills. 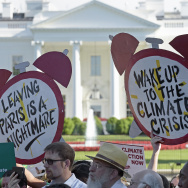 Beth Pratt-Bergstrom, California Director for the National Wildlife Federation, said the crossing is important in light of the recent deaths, because any losses are significant in such a small and isolated population. “They are on an island right now. Let’s get them off an island. 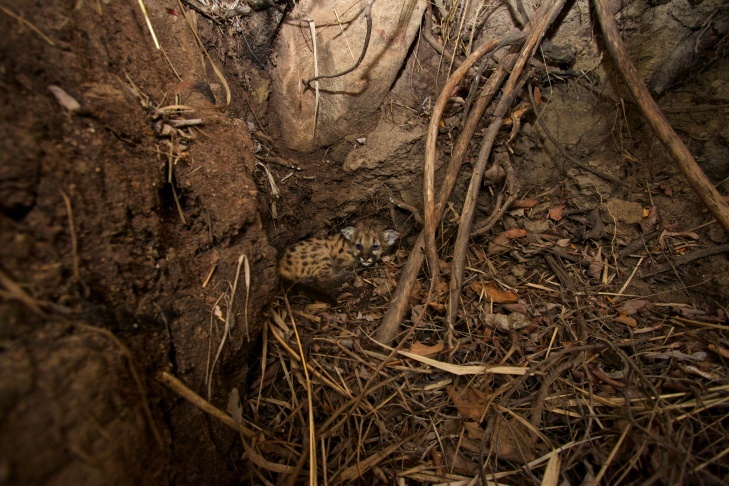 It doesn’t mean these problems won’t occur, but a wildlife crossing will make this population much more viable so when these things do occur, there’s much more of a robust movement so that these cats have a future,” she said. 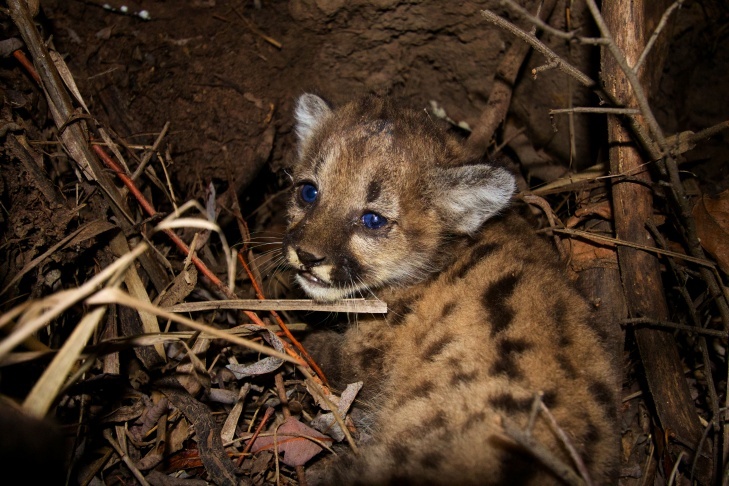 Correction: A previous version of this post erroneously stated that the primary cause of death in mountain lions in the Santa Monica Mountains since 2002 is infanticide. In fact it is intra-species conflict, of which infanticide is a part.